If you have hammertoe, it means one or more of your toes have bent abnormally. It can develop in any of your toes, but it usually affects the middle three and, most often, the second toe. It tends to run in families. Hammertoe happens because the muscles and tendons of your foot don't work together properly. Over time this makes the toe bend into the hammertoe shape. If your toe stays in this position, the muscles and tendons tighten, and your toe will stay bent. nerve and muscle damage caused by diseases such as diabetes. 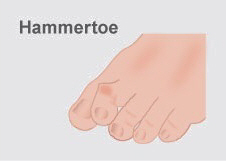 How do I avoid getting hammertoe? Also make sure you limit the amount of time you wear high heels, and keep your toes flexible with stretches and exercises such as picking up objects with your toes. When buying shoes for children, make sure they are fitted properly, especially at times when they're growing rapidly. As long as hammertoe isn't causing any pain or changing the way you walk, it doesn't need to be treated. Hammertoe is usually irreversible but if you follow the points above you can slow it down. You should see a podiatrist if your toe is painful and you have difficulty walking. The podiatrist will be able to provide advice and treatment, which may include padding the top part of your toe or taping it to change its position. You can find a podiatrist by searching on Podiatry NZ's website. Written by Podiatry NZ. Adapted by HealthInfo clinical advisers. Page created January 2016.